The causes of headaches and migraines can be complex and varied. However, when you have a headache or migraine that originates from the neck (most often starts just on one side of the head, can occur around the back of the skull, around the temple or behind the eye), there are some really common postures or movements that can cause them. *Remember, this may not be whole story, and you should always check with your GP or Myotherapist to ensure you’re getting the best treatment for you. If your headache is very severe, comes on suddenly, and/or is accompanied by other serious symptoms like disrupted vision, numbness, pins and needles or weakness, seek medical attention immediately. Sleeping on your stomach means that to breathe, you have to sleep with your head rotated to one side. Staying in this position for hours, night after night, can cause the muscles in your neck to adaptively shorten on the side you’re turning to, and lengthen on the side you’re turning away from. This can lead to the muscles fatiguing quickly while trying to do their normal jobs of moving and stabilising your head when you’re awake, which in turn leads to spasm and headaches. Changing sleeping patterns is not as hard as you think! It may take a couple of interrupted nights, but if you can begin to become aware of waking up on your stomach during the night, switch to sleeping on your side. If you stick with it, the pattern will become normal for your brain over a few weeks. If this is not enough, you can set alarms for every couple of hours during the night for a short time, or even try hugging a pillow to stop you rolling face down. 2. Chewing Gum / Clenching Jaw / Grinding Teeth. Overuse or misuse of the jaw can cause a cascade effect, which can lead to neck issues and headache. When chewing, clenching or grinding becomes a habit (even when you’re sleeping), your jaw muscles can become overused and dysfunctional (sometimes just on one side of the jaw, sometimes on both). This can cause a whole bunch of issues related to the jaw and teeth (which we will leave to your dentist), and it can ALSO cause headaches and migraines. There are significant connections from the jaw, both neurologically and biomechanically, to the upper cervical joints and muscles – and both the overuse and misuse of the jaw can cause neck related headaches and migraines. Referral to a dentist to assess the TMJ (jaw) issue and possible fitting of a night splint to stop the clenching or grinding when you’re asleep. Retraining your bite biomechanics with Myotherapy treatments and rehabs. Looking at the reasons behind why you’re clenching or grinding. Is this a stress response? Or just a habit? We can help identify physiological stress responses (as in ways your body moves when you’re stressed) and suggest ways to change them, which in turn will take pressure off the jaw and upper neck region (and alleviating the resulting headaches). Injuries like whiplash, or chronic neck compression (like falling off horses as a kid or getting dumped in the surf) can cause long term biomechanical changes in your neck joints, and surrounding soft tissue. It can also promote a continuing neurological “protection” loop – a brain memory response that keeps the area tight and in pain. This one does need extra help. By seeing a Myotherapist, we can turn down that feedback loop, reduce the pain response, and give you a good rehab plan that will help keep your neck working as best as possible for you. It can be a medication free way to look after your neck, reduce any referral headaches, and manage your injury. Some people are just born floppy! That extra flexibility can be awesome for party tricks, but also comes with it’s own set of problems. Sometimes, it means that there may be some instability in the spinal movements – small on their own, but over time, with other contributing factors (like desk work or any of the issues listed above) it can lead to headaches. The neck muscles tighten to aid the ligaments in stabilising the joints, and can then cause trigger points and joint pain referral to the head, felt as a headache or even a migraine. 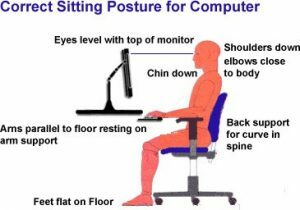 Try to avoid dodgy postures while sitting at a desk (SEE THIS AWESOME BLOG). Strengthen your neck and upper back stabilising muscles with exercises such as chin tucks and seated rows. Lay off over stretching the region, at least until you talk to a Myotherapist about which stretches will help! Use a hot water bottle or a heat pack on your neck to help reduce the pain to the head. When using any sort of computer, your screen should be lifted to your eye-line. Looking down (as you do with a laptop) means your neck muscles are constantly turned on, in a stretched position, trying to hold your heavy head up! This means they tire quickly and tighten up, possibly causing head and neck pain. This is compounded when you repeat the action, day after day after day… Ouch! Buy a bluetooth keyboard today! You can find fairly cheap ones even in supermarkets these days. Then take your laptop, and place it on a shelf/books/whatever works to lift it up to your eye-line, while placing the keyboard at elbow level (see the picture). This creates a much better posture while you use your laptop and reduces the stress on your neck and shoulder muscles and joints. Hopefully these tips can help you reduce your headaches and neck pain! If you are still suffering, or just want an expert to have a look over your painful condition, give the Myotherapists and Remedial Therapists at Mobilise a call today! See our website for more details!